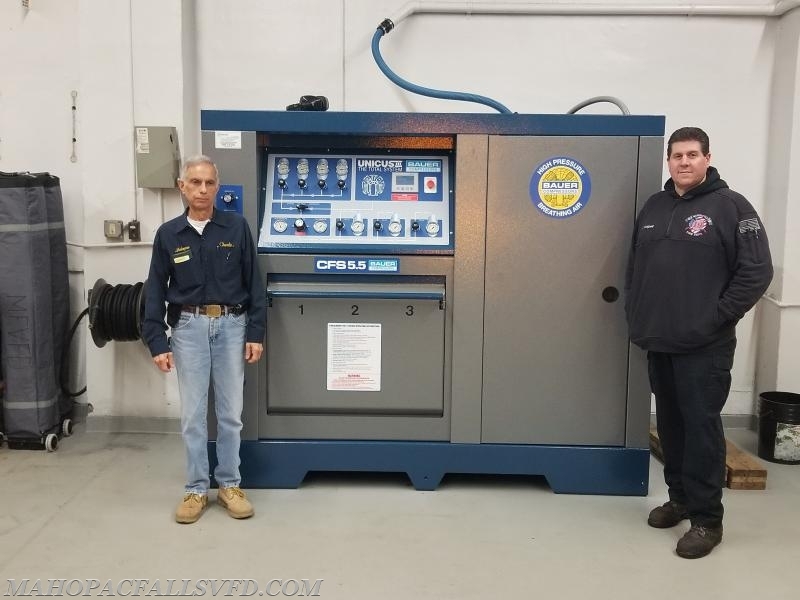 The Mahopac Falls Volunteer Fire Department took delivery of their new Bauer compressor system last month. Thanks to the efforts of First Assistant Chief Jeffrey Boyle, Vice President Lou Scagnelli, Ex-Chief Charlie Castronovo and the support of Senator Terrance Murphy, the department was awarded a SAM Grant from DASNY in the amount of $50,000. This grant covered the entire purchase price of the desperately needed new compressor system. The compressor system is an important part of our equipment, providing us with specially filtered and purified GRADE “E” breathing air. The unit is used on a daily basis to refill our SCBA bottles and SCUBA tanks, as well as the emergency storage banks on our heavy rescue truck. The custom built unit is a state of the art BAUER UNICUS III/13H E3 unit which replaces our 28 year old Bauer UN12 system. It is equipped with 4–ASME lifetime storage bottles each having a 6,000 psi capacity. The unit has a Securus triple filtration system and can compress air at a rate of 13 cfm. It is also equipped with a built in shore line allowing us to quickly refill our heavy rescue truck after a response without changing lines or fittings. In addition to answering over 800 calls each year, MFVFD is the only department in Putnam County with a fully operational Dive Rescue Team. Our heavy rescue truck also carries four - 6,000 psi storage tanks which supply mobile air replenishment at all fire and dive calls. Having a compressor system on site allows us to get our equipment refilled and back in service immediately after returning from a call, therefor limiting down time and out-of-service intervals. We are thankful to NY State and Senator Murphy for awarding us this Grant. We will continue to work hard and do our best to serve our community!